The new website tool lets clients quickly get a feel for how big the target audience they can potentially reach with a Callbox campaign. As part of its mission to help B2B marketers make data-driven decisions, Callbox recently unveiled an interactive tool on its website that allows customers to preview the company’s massive in-house contact database. The latest website enhancement gives clients a crucial piece of information for their targeted marketing initiatives: the size of their target audience. Contact lists can make or break an outbound campaign. That’s why the Callbox team wants marketers to catch a glimpse of the data resources Callbox can offer. Knowing this information can help marketers estimate whether their target segment is large enough to achieve their desired results when targeting a specific region. Using the interactive data preview tool, visitors can choose a country from a drop-down menu and view record counts broken down by industry, employee size, and annual revenue. The available countries currently include USA, Singapore, Australia, UK, Malaysia, Hong Kong, New Zealand, Canada, and China. Users can then drill down further on the country totals by looking at record counts under specific industries and firmographic attributes. The tool also returns the total number of contacts with valid email addresses, as well as how many unique companies and organizations that potentially match their ideal customer profiles. The Callbox team is planning to add more features to the data preview page, including the upcoming “My Industry Insight” tool, which will allow users to get an in-depth overview of their target industry or vertical. Callbox maintains an in-house database of over 44 million decision makers from organizations around the world. The company acquires, verifies, and manages prospect data through a combination of automated and human-enabled processes. Callbox employs full-time data specialists and uses robust database management tools that guarantee data accuracy, completeness, and timeliness. The data preview tool can now be accessed at https://www.callboxinc.com.au/record-list-by-country/ and is open to all site visitors. Try out our Record List Preview Tool now! Callbox’s 2018 event calendar kicks off with this year’s much-awaited LeadsCon conference, which takes place March 5 to 7in Las Vegas. LeadsCon Las Vegas is the first leg in a two-part series of yearly expos that focus on customer acquisition and conversion strategies. The 3-day event, scheduled for March 5 to 7, 2018 at The Paris Las Vegas, bills itself as “the performance marketing conference”—and for good reasons, too. Callbox has always been open to learning about tools and tactics that help the company improve its services. That’s why we always make it a point to join marketing conferences like LeadsCon. What we’ll pick up at the 3-day show will surely drive better results not only for the Callbox Team but for our customers as well. So, if you’re also headed to LeadsCon Las Vegas 2018, we’d love to meet up with you there. We can’t wait to meet and connect with you. Schedule our meetup, click the banner below! The holidays are once again upon us. That means it’s time to kick back, relax, and get into the festive mood. In the spirit of the season, we bring you this little infographic that shares how the Callbox team joins the celebrations. This year’s company party is a fitting conclusion to an amazing 2017. But the year-end party goes beyond celebrating business successes. It’s about showcasing the Callbox culture and identity. We always plan the party around maximizing team interaction. We’re a relatively big family, so this is one way of helping everyone get to know everybody else. Charity has always been a part of Callbox’s holiday tradition. In fact, giving back to the community forms part of our calendar the whole year round. Each year, we carry out feeding programs, help deliver relief goods, and conduct after-school learning projects. The holidays simply wouldn’t be complete without donations and volunteer work from the team. Callbox is a family of generous gift givers. When the holidays roll around, everyone’s busy making their list and checking it twice (and sometimes even thrice). The Callbox team has its own take on the Secret Santa tradition. Everybody gets little presents from their Secret Santas weeks before the actual gift exchange. Nobody at Callbox shies away from a contest. That drive to compete and win makes Callbox the company it is today. It also makes the holidays really exciting. Each December, different departments go head to head, showing off their skills in activities such as Christmas tree-decorating and choral singing. Being part of the Callbox team means your performance doesn’t go unnoticed or unrewarded. December is the time for recognizing the great work that everybody’s been doing for the past 12 months. We make the holidays even brighter by letting the Callbox team’s stars shine through awards and prizes. For most companies, the run-up to the end of the year is when annual reviews and planning kick into high gear. At Callbox, we turn these activities into a holiday staple. We take a collaborative approach to planning and review. This means that we sit down as a team and work out where we’ve been and where we’re going. Looking back, we’ve had a lot of fun and learned a lot in the Savvy Marketer blog. We really hope you’ve enjoyed and gained from what we had put out here in 2017. Looking forward, we’ll continue publishing great content for B2B marketers as well as try out new ways to share insights. Get to know Callbox even more, Inside and Out the Box! Read more stories, tips, and ideas, check out The Savvy Marketer’s Blog! Yet another big win for Callbox this year as product review site Comparakeet gave it stellar scores in the field of B2B lead generation. 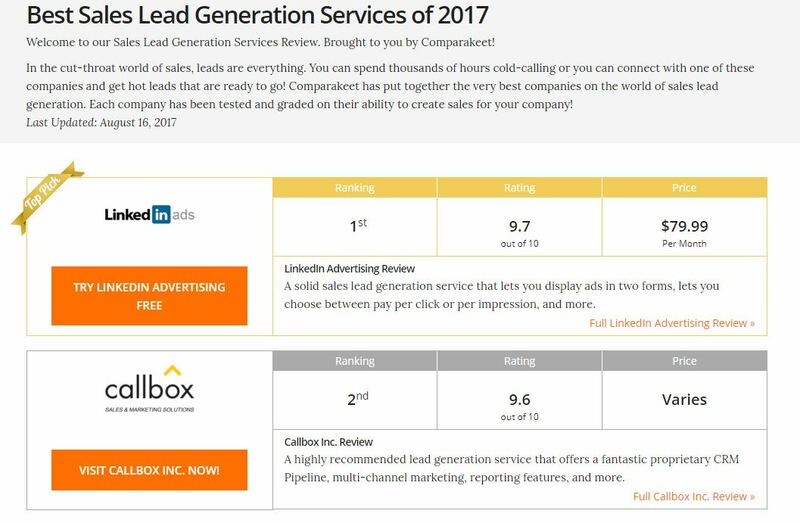 With a near-perfect score of 9.6 out of 10 on the site’s list of top lead generation services, Callbox has secured a good standing, second only to LinkedIn Advertising Review. This only shows Callbox’s own capacity to be among the B2B marketing industry’s top brands. With experience across a wide range of industries, marketing disciplines and platforms, the firm has become a household name for COO’s and executives that want only the best results in their lead generation and appointment setting. For Janus Jarapa, several indicators show why Callbox deserved the second spot in Comparakeet’s list. The first thing he underscored was Callbox’s ability to allow clients to choose between traditional or online marketing. Being already an expert in multi-channel marketing, the service is readily capable of handling telemarketing, social media and email marketing campaigns. This allows Callbox to open up avenues for generating a consistent amount of high-quality leads. Moreover, Jarapa has his hands down for the service’s database of qualified marketing leads. Containing over 50 million contacts, the database enables companies to focus on the leads that matter and ensure their pipelines never go dry of sales opportunities. Added to that is Callbox’s ability to provide a corps of capable individuals that are specifically trained to help companies nurture and convert B2B leads. Not only do these companies get just telemarketers, they will also get teams that will work round the clock to keep the pipeline fed but never satiated. Callbox also provides its clients with opportunities to interact with their designated teams to keep the marketing momentum alive. An added feature that Jarapa underscores in his review is Callbox’s “robust reporting.” Companies need to know about their campaign’s progress and whether they are working to generate sales as they are supposed to. So, Callbox’s commitment to accurate reporting and campaign transparency provides clients with access to crucial information reflecting the performance of their campaigns. This is possible through the company’s own in-house marketing software system, Callbox Pipeline (formerly PipelineCRM). The system provides clients basically the power to scale their campaigns and position their message front and center so they can generate a great deal of B2B leads to that effect. Related: Callbox Gets a Nod from Comparakeet! With all these nifty characteristics in mind, no wonder Jarapa gave a stellar review for Callbox. He concludes it by saying that Callbox is a “complete, customer-friendly lead generation service” that companies from across a wide range of industries should seek. With that said, companies are sure to find an important marketing ally in Callbox. Take a closer look at the review here. Callbox Sales and Marketing Solutions took the top spot in the 2012 Sales Lead Generation Service Comparisons conducted by TopTen REVIEWS (TTR). Callbox ranked 1st, with an overall lead generation quality score of 9.98 out of 10. The companies were reviewed and ranked using a 10-point scoring system based on four categories/service features: Lead Generation, Tracking, Reporting, and Help & Support. Callbox scored 10/10 on the first three categories and 9.8/10 on Help and Support due to absence of a FAQ page at the time the review was conducted. The reviewers however praised the company’s online chat support and its excellent response times to email questions. Other notable features mentioned in the review included Callbox’s excellent lead tracking system, real-time reporting, and its balanced marketing approach using the right combination of telemarketing and online tools. TopTen REVIEWS (TTR) is one of the most popular and trusted aggregate review sites by size and traffic, with the largest online database of media reviews. By taking the top spot on the 2012 list, Callbox has once again affirmed its position as a market leader in sales lead generation across all marketing channels. Callbox Gets a Nod from Comparakeet! Can Callbox get any better? Well, apparently yes, because according to a top product review site, we belong to the top brass of lead generation services out there! As a full service B2B lead generation company that caters to a diverse range of industries, Callbox has provided only the best in terms of nurturing client interactions and qualifying leads to grow sales and improve revenue performance. But more than that, Comparakeet has also noted Callbox’s willingness to bring their client’s marketing through whole new levels using a multi-channel approach. 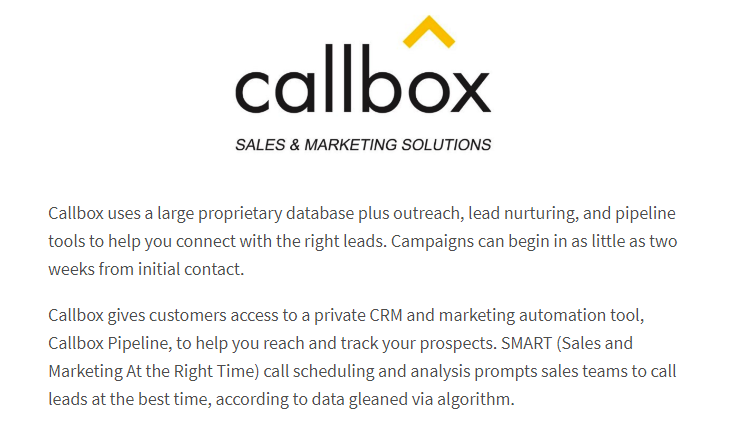 As companies right now outline the need to improve and streamline their lead generation and appointment setting efforts, Callbox has truly made a name for itself in its own turf. Want to know more about why we’re on top? Feel free to read up on what we are REALLY capable of. Learn more about or Multi-Touch Multi-Channel Marketing Approach. Get to know us even better. Watch About Callbox video! https://www.callboxinc.com.au/wp-content/uploads/2017/06/01-blg-best-sales-lead-gen-2016.jpg 352 800 admin https://www.callboxinc.com.au/wp-content/uploads/2019/01/callbox-logo.png admin2017-06-16 06:31:452018-09-06 14:16:42Callbox Gets a Nod from Comparakeet! Things are looking good for the Philippine economy. Considered the “sick man of Asia” not long ago, it has transformed into a “Rising Tiger”, thanks to a stable fiscal and monetary system and a sound macroeconomic policy. That the government singled out Business Process Outsourcing as a high-potential and priority development area for investment was a smart move as far as economic foresight is concerned. Over the past decade, the Philippines’ BPO industry has seen tremendous growth – revenues and employment have expanded tenfold since 2004, and the industry sees an average yearly growth rate of 20 percent. In the “Philippines Special” episode of Money Mind aired over Channel News Asia, the Philippines was lauded as Asia’s fastest growing economy, due in large part to the flourishing BPO industry. As a matter of fact, the BPO industry in the Philippines is one of the biggest driving forces of the vigorous economy. Consider this: during the global financial crisis in 2009, it was (only) the overseas remittances that kept the country from recession. The year after that — and this was when the country was universally acknowledged as BPO Capital of the world – almost $9 billion in revenues was generated by the 500,000 employees in the BPO sector. Fast forward to 2015: the BPO workforce has more than doubled – more or less 1.1 million – and the revenue increased by 114% to more than $21 billion. That number is second only to the remittances by Overseas Filipino Workers ($26-30 billion). Clearly, the title “BPO Capital of the World” isn’t just for bragging rights or some nominal honor. It cemented the nation’s stake as the next techno hub, and more importantly, brought food to millions of tables. But here’s the best part: the BPO revolution didn’t just cause a stir in the capital city. 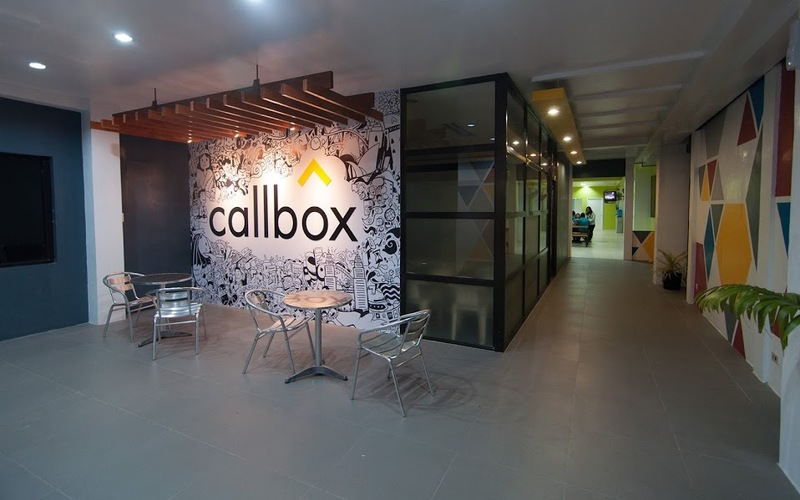 In fact, when BPO was just a fledgling industry in the Philippines, one company has already started to make a name for itself in Panay Island in the Visayas: Callbox. In 2004, a small startup in Los Angeles decided to set up shop in Iloilo City, the regional capital of Western Visayas. This, after the company’s founder and CEO, Rom Agustin, realized that, on paper, his home country had all the key ingredients necessary for it to transform into a growling tiger: a fast-growing middle class with money to spend, low labor and operating costs, and a 90-plus-million strong, largely English speaking population. Fueled by the desire to give back by investing in the country’s most important resources – its people, Mr. Agustin chartered a clear course towards success in the BPO industry. It turned out the opportunity was better-looking in reality than it was on paper. In a little more than a decade, the homegrown company with a humble office in Iloilo City has expanded to Davao, another booming metropolis in the southern Philippine island of Mindanao, to offices in the US, the UK, Australia, Singapore, and Malaysia, serving hundreds of multinational companies from more than 20 countries around the world. Locally, it has spurred economic growth, paving the way for other BPO companies to invest in Iloilo City. The influx of BPO firms provided thousands of jobs to the tech-savvy young population, which in turn, had a positive effect on a number of other business areas, such as the retail, real estate, and telecom industries. Incidentally, Callbox’s CEO Rom Agustin had known that way before it became a catchphrase. Iloilo, City, Philippines, Sept 7, 2015 — Business process outsourcing (BPO) firm Callbox, one of the original BPO companies, to invest in Iloilo City, is investing additional money to expand its operations in the city. Callbox chief executive offficer Rom Agustin stressed that the investment bodes well for its plan to create 2,000 new jobs by 2016. Callbox will acquire more facilities as well additional manpower to strengthen its growing worldwide operations. “The expansion will secure a dynamic future for the company, bolster our commitment to deliver quality services, and provide a terrific boost to the local economy by creating more full-time jobs for the Ilonggos,” Agustin said. “The low cost of doing business in the city and the availability of a large talent pool possessing strong English skills make it a top destination for business outsourcing,” Agustin reiterated. Callbox will hire additional customer service representatives (CSRs), search engine optimization (SEO) specialists, web developers, web designers, and graphic designers. Originally published in ContactCenterWorld.com here. 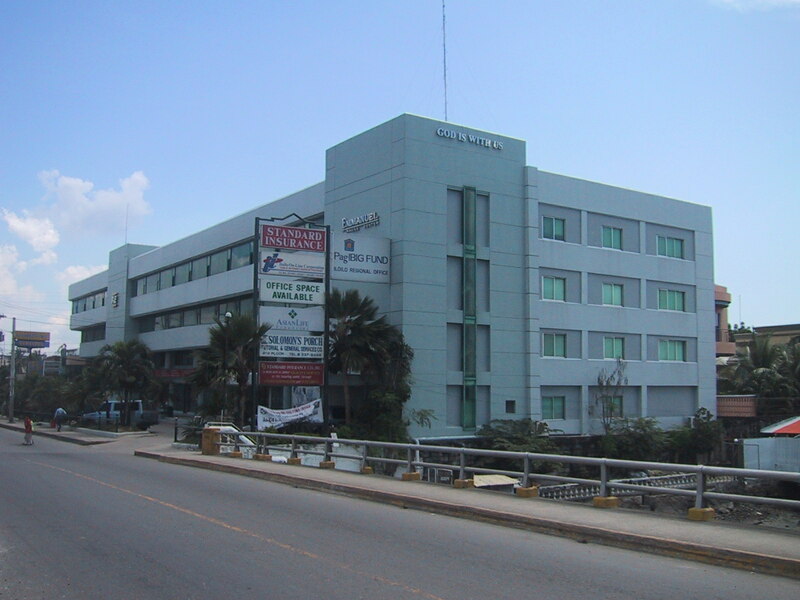 Los Angeles, CA – November 25, 2005 – based Callbox, officially opened its second facility in Iloilo City, Philippines on November 9, 2005 to meet increasing demand for its world-class outsourcing services. The sprawling site, topping 16,000 square feet was specifically designed for modern task-group style operation, allowing dozens of clients to be served by their teams in dedicated office suites. Custom-designed workstations provide agents more workspace, more comfort, easier inter-team coordination, and a more creative environment than any call center to date. Callbox can now accommodate over 450 highly qualified agents and technology specialists. “Callbox is not surprised to be doubling its capacity for the seventh straight quarter. It’s only good business to respond swiftly to sheer demand. It’s simple reinvestment in our people and our clients.” said Glen Norris, Chief Operations Officer. Due to demand for ever-broader services, Callbox is designing all unmet infrastructure projects to scale directly to large-scale business process outsourcing center. Callbox continued its technical innovation by integrating all call reporting and telecom operations seamlessly with the first facility, proving their concept of open source LAN independent call processing. It’s important for our clients not to be limited to any third-party feature set or hardware, whereas our main concern was to prevent geography from limiting our clients’ expansion. The only solution was to design and build our own switch network. Writing the first end-to-end open source contact center took us man-years, but now we can provide exactly what our clients request, 90% of the time. …[and] we’re free to scale just as fast as our clients want to grow, unharnessed by expensive hardware and consultants. That’s a good feeling. Within three weeks of opening, the second facility already accommodates 11 new accounts. With technological proof-of-concept behind them, and daunting business volume on the horizon, Callbox will begin third facility drawings January 2006 in order to break ground within 12 months. Los Angeles, CA – February 5, 2006 – Callbox launched PipelineCRM©, the first web application developed to provide managers and sales professionals an ideal customer relationship management system that transparently integrates the contact center (“call center”). Built with best practices, open source architecture, the PipelineCRM©, intuitive “Outlook-alike” dashboard incorporates email messaging, quality monitoring, digital voice recording, and call list and prospect import/export. PipelineCRM©, is the result of years of cooperation and client feedback, capitalizing on well-evolved processes. Managers can view the dashboard and sales pipeline of any sales agent, any region, or the whole campaign, at any time, from anywhere, and get an up-to-the-minute report on both closed sales and forecasting in any format [html, csv, pdf]. Sales Managers love it. PipelineCRM©, is a clear indication of Callbox’s continuing commitment to delivering client satisfaction through “managed and measurable” growth. Callbox provides PipelineCRM©, to all clients as part of Callbox’ customer contact services package. Contact Callbox for a demo now.